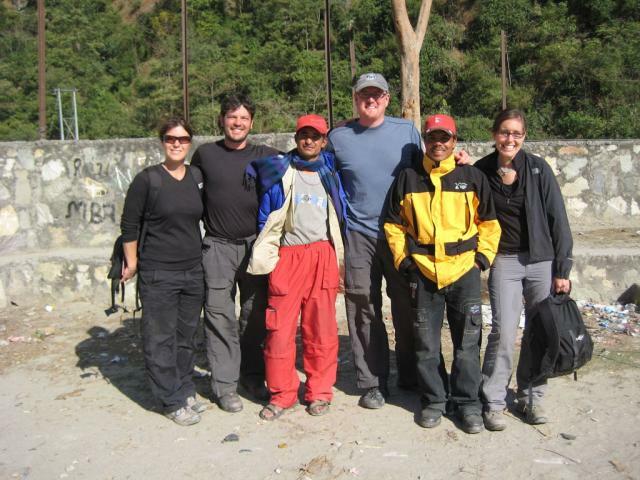 A hike through the mountainous areas of Nepal is the holy grail for passionate hikers. While I don’t think I fit in this category, the hike that we finished a few days ago has been a dream of mine for many years. There are many different trekking options in Nepal – the most popular being treks in the Everest region (where you can trek to the Everest Base Camp) and the Annapurna region. Each of these areas offers up hikes lasting anywhere from a day to a month. 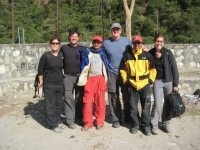 After some brief research, we chose the Jomsom trek in the Annapurna region. 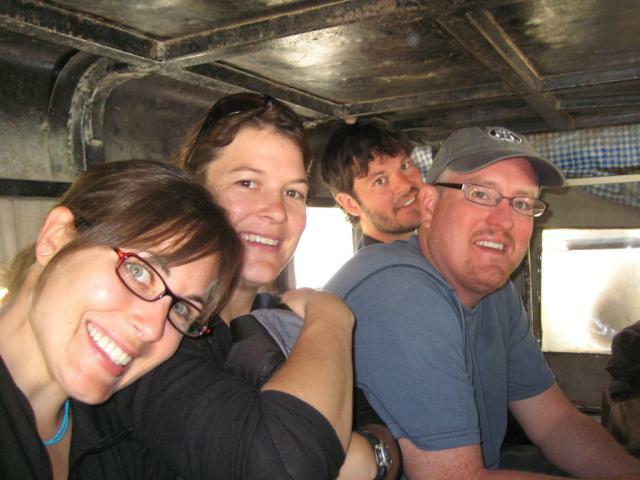 With our overly high-tech gear in tow, we (Shanna and I, along with our Nashville friends Kelly and Michael – a/k/a Miguel Leather) boarded a small plane in Pokhara for a short flight to Jomsom that included some amazing views of the Himalayas. Less than 30 minutes later, we were on the ground and off to find porters to carry our gear for the next few days. Immediately upon exiting the airport (which consisted of a building about the size of your average garage), a swarm of porters about half my size attacked us. At first, I was surprised when they quoted us a price of $100 per day to carry our bags. Then, I realized my math was faulty and they were only asking $10 per day! After a quick reference check by a woman in a local restaurant (we’d heard stories of so-called porters who quickly port your bags to unknown destinations), we had hired Mr. Bihm (or Beamer as we preferred to call him) and Obada for the nest 4 days. The combined weight of the pair was around 225 pounds, with 125 of that attributed to Obada. Guilt overwhelmed me as I handed over my 35 pound pack to Mr. Bihm. Our trek over the next four days was gorgeous, starting in the arid landscape near Jomsom and ending in the lush tropical area near Beni. The trek passes through Nepalese villages, crosses raging rivers and collides with large groups of pack mules carrying goods to the next village. Along the way, humbling views of mountains over 20,000 feet were our constant companion. The treks in Nepal are sometimes called “teahouse treks” due to the numerous teahouses dotting the trail providing meals, lodging and, of course, tea. The accommodation in the teahouses is quite basic with prices to match – most cost between $2 and $4 a night (which, in the case of at least 1 guesthouse, was a rip-off; the room was worth $0.82 at most). The greatest excitement of the trip happened on night 3. As we ate dinner at a teahouse down the road from our guesthouse in the village of Tatopani, a thief broke into our friends’ room taking away 2 ipods, a digital camera and around $50. After we relayed the news to our 2 porters, the entire police force of the town arrived and went into action – at first wrongly accusing the owner of our guesthouse who was evidently angry at us for eating at a restaurant down the road. Then, Miguel Leather and Kelly took part in an unsuccessful chase down the streets of the village when it was discovered that the thief had robbed several guesthouses and was on the loose. Later that night, Beamer arrived to tell us that the thief’s hiding place had been discovered near the town, several of the pilfered items had been recovered and the thief had escaped the authorities by diving into the turbulent river near the village (where, according to the police, he most likely met his maker that night). After a quick trip to the police station, Miguel Leather triumphantly returned with the Ipods and camera – the $50 was either on the washed-away corpse of the thief or used as a “service fee” by the local cops (we’ll never know). Regardless, the recovery of the electronics was a huge victory. As celebration for the recovery, we rewarded ourselves with a very lazy day in Pokhara – a beautiful lakeside town – upon return from the trek. Before we flew back to Kathmandu the next afternoon, Shanna and I had a flight of our own – paragliding off a mountain above the town. A video of the flight is below.